This conversation was taped by the son of a Danske Bank International S.A. victim, and Soren Glente, at the time one of the bosses in charge of selling the Capital Assurance. The conversation had already been postedin this site but now, we have the most relevant parts in writing. S.B. : How would you describe the risks of this product? S.B. : and was that made clear to the client? S.B. : so the income from the loans, sorry the income from the assets and investment would never cover the loan? Ehh? S.B. : do you think my clients understood that? S.B. : did you know the others, do you know, how many other clients did you have like my parents? S.B. : and do you still sell this Company insurance scheme product? S.B. : from who, may I ask who from? We conducted our due diligence according to the internal rules and procedures Danske Bank Luxembourg has in place. 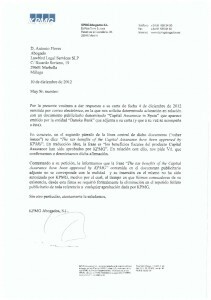 As part of this process, the Capital Assurance product, sold on the basis of a tax-planning proposition, was fully cleared by KPMG. We therefore reject the claimant’s action for it is groundless, without merit, and we will defend ourselves vigorously. Fully cleared by KPMG? What does that really mean in Danske Bank Luxembourg banking jargon? 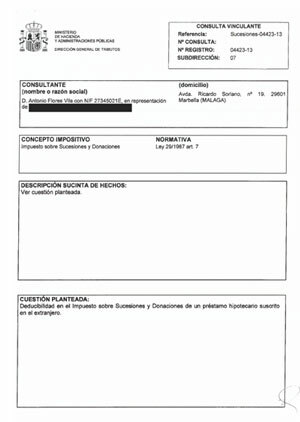 Mr. Klaus Mønsted Pedersen: have you read the attached document by KPMG Madrid, denying that they ever gave the blessing to the cash-predatory tax-evading Capital Assurance Product, ever authorized your company to use their name and in fact, formally requested you to eliminate from the brochure any reference to the product being approved by KPMG?